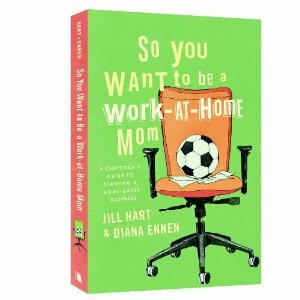 Jill Hart and Diana Ennen recently approached me about a review for their book, "So You Want to be a Work-At-Home Mom". I accepted the offer thinking I would use the book for a giveaway. Hey Ladies, I actually read the book from cover to cover! I even took notes. I googled it. The website is number two, right after Amazon.com. The advice given in this book is written from a Christian perspective based on honesty and integrity. These ladies have been there, done that. Although I have been blogging for awhile now, I still have many questions. "So You Want to be a Work-At-Home Mom" is written in an easy, conversational style. Think the WEB MD commercials where the doctor is sitting in on the couch with a bunch of Moms- that's how you'll feel about Diana and Jill. It is motivational offering proven success tips. The book is designed to educate stay-at-home moms on work from home opportunities. Not only does it answer the tough questions- it details how to find the answers and put them into action for your business. Can't think of a good business proposal? The book is filled with real, concrete ideas. Do you ever get those emails offering thousands of dollars per week for WAHMS? You get a link to a site that is full of hype but doesn't let out the big secret. You are dying to know the big secret. Maybe, just maybe it is really true and you are missing out on a fantastic opportunity. Ladies, I know the big secret. Don't fall prey. It may not be a scam but it will take tons of your money, time, and integrity. This "opportunity" is for Herbalife. It could be right for you but the odds are against it. Why am I telling you about Herbalife? Because, this is not one of those get-rich-quick scams. "So You Want to be a Work-At-Home Mom" is written by real moms, just like you. You probably won't get rich quick but you might have fun trying. SAHM/WAHM bloggers, this is a must read. SAHM/WAHM others - take your home business to the next level with these great tips. Write your own press releases, fix your SEO, learn how to market yourself online. Follow, Follow, Follow me wherever you can find me. For every new follow, you'll get an entry into a random drawing. All you have to do is leave a comment letting me know where you are following. At the end of the month, any follower who helps me reach my goals (listed below) will be in the running for a prize package that includes a $15 Amazon gift card and lots of crafty goodies for you and the fam. I can't wait to send you this little gem. Get clicking. Surprise me--I have accounts with DIGG, Stumbleupon, Goodreads, Picket Fence Blogs, and several Mommy Blogger's sites you can add that too for bonus points. Just let me know- I don't get around to all of them very often. Everywhere you follow gets an entry. You might want to save them for upcoming Friday Follows - I have tons more books to giveaway. I tried the other links..but I can't figure them out, sorry!! Thank you for sharing this, I hope I could get a copy for my wife.